Since the spring water of this district is famous among the Japanese, you will see many people visiting this Michi-no-eki ‘Hakushu’ to get the water. On sunny weekends, you will find queues on taps with empty bottles, some with huge gallon bottles to take them home for their daily use. Dripping coffee or brewing Japanese green tea out of this water is said to give great tastes. We didn’t try the coffee nor the green tea with this water for we couldn’t keep the water till we got home but this proves that the water indeed tastes good enough. 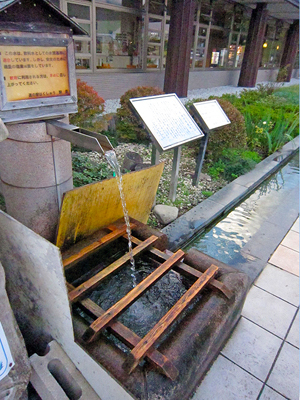 When you reach this Michi-no-Eki ‘Hakshu’, the first thing that catches your eyes should be the little fountain like taps where you can get the water and the stream with a tiny bridge that leads to the building. 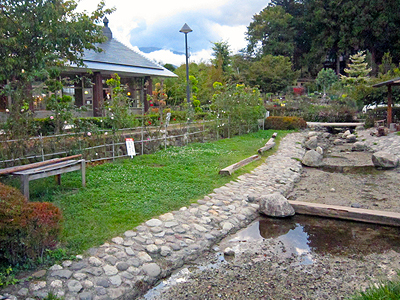 The little stream is a man-made stream but the water flowing is of course the natural spring water from Kai-Komagatake mountains where the water is filtered through granite, containing molecule amount of carbon dioxide, calcium, magnesium, kalium, silicon and etc. in a great balance. The water from Kai-Komagatake forms its flow as Ojira River which runs at the back of Michi-no Eki ‘Hakushu’. You can find some kids playing or people soaking their hot feet from trekking in this stream during summer which is one of the recommendations of the place if you want to cool yourself down a bit. 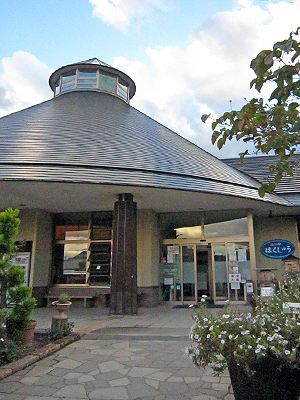 Inside the building, there is a simple restaurant where you can feed yourself with Japanese combination food and plain food such as Curry rice and Ramen (noodles). The ‘ought-to-see’ is a market place where they sell seasonal crops which are provided by farmers in this district. Some of the crops are typical Japanese which should be new to some of you, some very familiar though different in size, colour or shapes. Some of the farmers of this district are attempting to grow crops which are pretty new in Japan which could give you some offer in making your traditional dishes while you are in Japan. We bought a pumpkin called ‘Butter Nuts’, this year’s national trend food in Japan, the other day which was my first time to cook or taste at this Michi-no-Eki ‘Hakushu’. The pumpkin is said to be Italian (We have never seen one in Italy though…) which is suitable for making potage soup and not for cooking in soy sauce like our traditional pumpkin dishes. The Butter nut pumpkin potage soup was just great! It tasted the midst of potato and corn, slightly sweet and creamy. Apart from newly crops, various kinds of fruits from spring to autumn are highly recommended here. Since the farmers bring their products directly to the market, the price is less expensive regarding the qualities. If you have chance to visit this area in summer or autumn, grapes are what you’ll have to buy and try! There are many kinds of grapes whose origins are outside Japan but the Japanese have bred to make full use of each characteristic that the grapes have. Some of the grapes sold here are grapes you can only taste in Japan and some are really expensive in an urban setting, which are sold in fair price here. You can find a neat corner of pot plants in the market where you can also find small Bonsai in decent price as well as nursery plants and seasonal flowers. They even sell interior type of pot planted vines with big Kyoho grapes in harvest which is really charming to grape lovers like us! Hakushu area is ideal place for camping or trekking. If you are planning for them, this place is ideal for shopping food since there is a local super market called ‘Every’ next door. If you can’t get what you want at Michi-no-Eki ‘Hakushu’, you can always buy the rest at ‘Every’. For souvenirs, local brand Sake (rice wines), local wines, local Miso (salty soy bean paste) are for your tries if you want to compare the taste difference among other areas. If you are brave enough, there is also the local Natto (fermented soy beans) which differs also from other areas. There are also handmade crafts and wood carvings of old Japan which district grannies make out of antique Japanese textiles, which may be interesting to those who like. Famous opulent natural spring water provided (Free of charge). Counted as one of the best natural spring water in Japan, famous to some because Suntory, Japan’s major beverage company, owns a Scotch whiskey factory in this area for the top quality water that the land provides. You can get the water from the taps set in front of the shop freely, for many people queue for their daily use especially on weekends. Plastic bottles are sold in the shop but you can always bring your own so don’t throw away your empty bottle after you finished your drink when you pass near by. Vegetables and Fruits of the zone, Japanese wines, Japanese whiskies, Japanese pickles, Miso (soy bean paste), Tofu (bean curd), Hoto, Soba and other domestic noodles, handmade sweets by grannies, handmade ham and sausages. Like other districts of the countryside, you can find raw rice and rice processed products as well as soy beans. The area also provides pretty much of wheat which is processed in flour, noodles and Miso. Various types of grapes such as Delaware, Berry A, Kaiji, Pione, Neo-Muscat, Kyoho, Rosario Bianco and Koshu appear on shelf throughout Summner and late Autumn. Origins of the grapes are outside Japan but the grapes which appear in this area are bred to make full use of each characteristic, ideal to eat fresh. 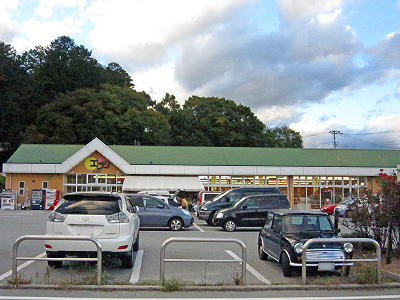 Address : 1380 Shirasu, Hakushu-cho, Hokuto-shi, YAMANASHI Pref.